Valley High School has a distinguished past and a promising future. 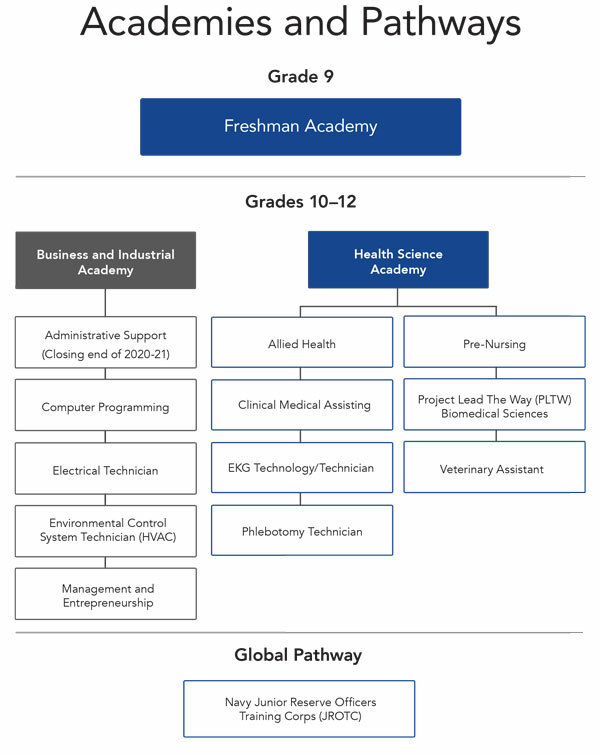 As an Academies of Louisville high school, Valley houses a Freshman Academy, Health Science Academy, and an Industrial Maintenance Academy. We take pride in our community business and industry partnerships. With their collaboration, we provide students opportunities to work with the latest technology in industry, job shadow, as well as earn experience and/or pay through year-round co-op, summer work programs, internships, and apprenticeships, in the career field of their choice. Students at Valley can earn nationally recognized industry certifications, and college credit by taking advantage of Advanced Program and dual credit courses. Our Navy JROTC program is second to none, and all VHS students have the option to be part of this leadership program in addition to their chosen career pathway. We house a state-of-the-art auditorium and the largest high school gymnasium/arena in Louisville. Valley boasts a variety of award-winning Performing Arts, Athletics, Chess, and extra-curricular programs. Our goal is to prepare students with knowledge, empower them with essential skills, and inspire them to pursue their post-secondary goals, so they become productive citizens in our communities. At Valley, our students learn to be safe, to be responsible, to be respectful and to do it … The Viking Way! VIKING time is a weekly opportunity for students to receive 45 minutes of individualized interventions based on their current academic needs. Those students who are on track use this opportunity to deepen learning in their preferred subjects or learn new skills in self-assigned enrichment activities.